Welcome to our brand new ProductiveMuslim.com site! Al-hamdulillah, truly good intentions and hard work pays off. After 3 months of gruelling work, a tight budget, and lots of to-dos, we’re pleased to launch our new site with you today. 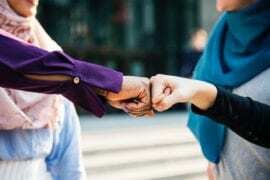 ProductiveMuslim.com has been completely revamped to give you, our reader, a much more fulfilling and user-friendly experience. 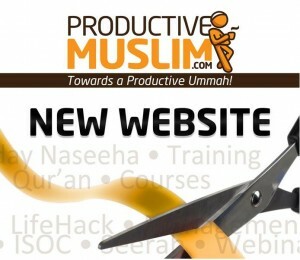 With a lot more functionality and features, new resources, and lots of behind the scenes development, ProductiveMuslim.com is now better positioned to be the no.1 resource for Muslims seeking to be productive inshaAllah! We’ve completely changed the philosophy and style of the website; from being a personal blog recording the thoughts and ideas of a ‘ProductiveMuslim’ to a professional organisation that’s run by systems, structures, deadlines and by many people contributing to it. We’ve created a new Research & Content team within our organisation who will be responsible for researching, editing and ensuring quality of content for all our readers. We’ve opened writing for ProductiveMuslim.com to any writer who wants to contribute an article on any topic that links Islam to Productivity or help Muslims become more productive in any area of their life. We’ve developed new resources, such as the weekly taskinator, habitator and a brand new beautiful wallpaper and we’re working on more resources in the coming months inshaAllah. We’ve completely revamped our weekly e-mail newsletter, it’s design and content, to provide you exclusive productivity content delivered straight to your inbox. In the end, I wish to thank all those who were involved in this project for their dedication and hard work, we could not have completed without your support. Special thanks to all those who donated to the new site and made this dream a reality for us. I also wish to thank my wonderful team for their hardwork, dedication and constant support. With that, I ask Allah (Subhanahu Wa Ta’ala) to bless this new website and make it truly an inspiration for you all. I also would like to request that you make dua for us, that Allah (Subhanahu Wa Ta’ala) purifies our intentions, and Helps us to do what we can for you to become more productive in this life and ultimately, successful in the Next.